By consistently making healthy food and lifestyle choices, including the choice to get adequate physical and emotional rest, your body's self healing mechanisms stand a good chance of restoring your health. If you're not sure how to go about making the best possible food choices to restore your health, be sure to have a look at our full body cleanse program - following this program for at least three weeks is an essential first step to recovering from the vast majority of health challenges that I've encountered. If you are already doing the best that you can with your food and lifestyle choices and you strongly feel that your body can use extra help in restoring healthy blood circulation and normalizing inflammation, I encourage you to consider this professional grade blend of Proteolytic Enzymes. All health conditions that are accompanied by inflammation can be objectively marked by two blood tests: ESR - short for Erythrocyte Sedimentation Rate, and CRP - a more sensitive and accurate marker for inflammation, and short for C-Reactive Protein. 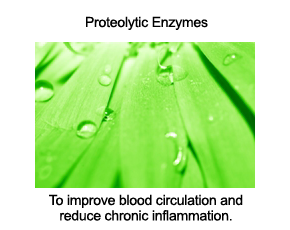 Our Proteolytic Enzyme formula safely and effectively normalizes inflammation in the body as it promotes optimal blood circulation and blood cleansing - this normalization in inflammation can be objectively marked by testing C-Reactive Protein levels before and after taking this formula for a fair trial period - in most cases, I recommend three to six months as a trial period. If taking our Proteolytic Enzyme formula for a period of three months doesn't lead to a substantial decrease in your C-Reactive Protein level, let me know and I'll see to it that you're refunded in full. If you don't have the resources to have your physician test your C-Reactive Protein level, this guarantee still applies if you simply feel that this formula doesn't help you in a significant way - I'm this confident in its potency and effectiveness. The effectiveness of this Proteolytic Enzyme blend lies mainly in its ability to breakdown a substance called fibrin, which is a substance that is produced by your body whenever you have to make and lay down scar tissue. Fibrin is the main component of scar tissue that is created whenever your body has to heal an injured area. In some cases, like a badly sprained ankle, some amount of scar tissue is good for promoting stability, but in most cases, particularly those involving your muscles and organs like your heart and lungs, you don't want excessive fibrin being laid down. You do want inflammation to occur whenever there is injury to a blood vessel or any other tissue, as inflammation is essential to proper repair of injured tissues, but you want the inflammation to occur in a controlled and efficient manner - this is what our Proteolytic Enzyme blend is designed to facilitate. All of these components of our Proteolytic Enzyme formula are derived from vegetable or microbial sources, and great care is taken to ensure optimal purity and potency of each batch. Doesn't put burden on digestive organs. In fact, the digestive enzymes that are included in this formula are often instrumental in improving digestion of protein, carbohydrates, and fat. Non-toxic- doesn't put stress on your liver like most prescription and over-the-counter drugs do. Also contains protease and lipase, enzymes that help digest protein and fat. Most enzymes formulas contain about 1,000 to 2,000 fibrinolytic units (FU's). Our formula provides 15,000 FU's per serving, and potency is guaranteed for at least two full years. Click here to try our professional grade, Proteolytic Enzyme blend. Q. Can I take this formula along with other supplements? A. Yes, it's fine to take the enzymes in this formula along with vitamin and mineral supplements. In many cases, the enzymes in this formula can enhance the effectiveness of vitamin and mineral supplements. Q. Can I take this formula along with prescription drugs? A. It's best that you check with your physician. Generally, the enzymes in this formula are safe to take with over-the-counter and prescription drugs, except for those that interfere with your blood coagulating mechanisms. Because these enzymes improve blood viscosity, it's always best to consult with your physician if you are on an anti-coagulant. Q. Are there any other circumstances in which I can't take this Proteolytic Enzyme blend? A. Large scale studies have not been performed on pregnant and lactating women, so if you belong in this group, it's best that you consult with your physician on the appropriateness of taking this formula. Q. I don't have any health problems, but I've heard that taking enzymes is good for disease prevention - is this true? A. In a perfect world where soil quality is good and you're consistently eating foods that are naturally rich in enzymes, you probably wouldn't need the digestive enzymes in this formula. Generally, most people will benefit from taking the systemic (nattokinase, serrapeptase, and ubiquinone) and digestive enzymes in this formula, as they're needed for virtually every biochemical process that occurs in our bodies. If you feel that your health can be improved by this formula, you can give it a try and measure your C-Reactive Protein level via a simple blood test before and after your trial period, and assess these numbers and how you feel to determine whether you should continue. Q. 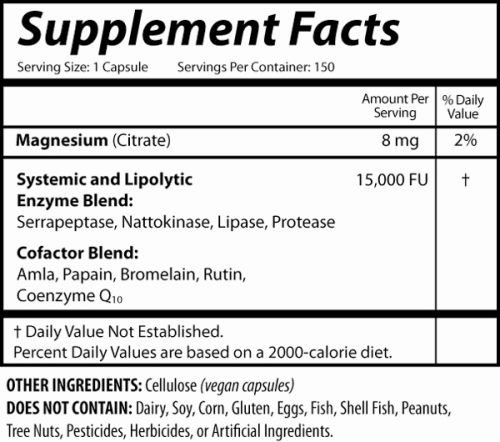 Do you personally take this Proteolytic Enzyme Blend? A. Yes, I started experimenting with this formula about a year ago when a friend asked for some guidance with a family member's health condition. I was impressed by the research behind these enzymes, particularly the systemic ones (nattokinase, serratopeptase, and ubiquinone), so I started taking it for preventive reasons. I haven't tested my C-Reactive Protein levels, but I have noticed that I can improve (shorten) recovery time between heavy hitting sessions (tennis) by increasing my intake of this formula. These days, I typically recommend this formula to people who are looking to overcome conditions that involve compromised blood circulation and/or chronic inflammation. Q. How many capsules are in each bottle and how many should I take? A. There are 150 capsules per bottle. For preventive purposes, two capsules per day is a good amount for most adults. For situations where there is a strong inflammatory component, in most cases, I think it's best to start with two capsules daily, and gradually increasing to six capsules daily over the course of a week. Once symptoms improve, you can reduce intake on a gradual basis until you arrive at a maintenance dose that helps you maintain the quality of life you're looking for. For most adults who are looking to manage an existing condition, one to two capsules daily is typically a good maintenance dose. Capsules can be taken with or without meals, but I have found that best results tend to come when they are taken on an empty stomach. For severe cases of chronic inflammation, one can even try going up to six to nine capsules per day until improvement occurs, then gradually reduce to a maintenance dose. But in all cases, you should consult with your personal physician on the appropriateness of these enzymes for your situation. Q. I am using your green food formula and feel improvement in energy, but I need extra help with my blood circulation and joint pain. Can I take the new formula in place of the greens? A. If I had to choose just one formula and my primary goal was to improve blood circulation, I would go with the Proteolytic Enzyme blend. 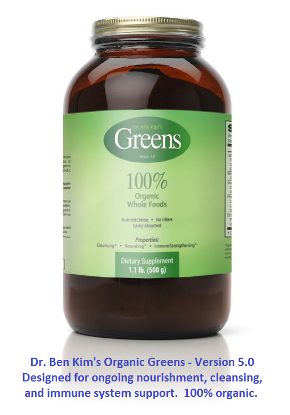 Our green food formula provides a better overall nourishing effect since it is rich in vitamins, minerals, and phytonutrients, but the Proteolytic Enzymes are second to no other natural remedies that I'm aware of for improving blood circulation. The strength of this formula comes mainly from the ability of serrapeptase and nattokinase to break down fibrin, thereby normalizing inflammation and improving blood viscosity. Q. How much serrapeptase, nattokinase, and ubiquinone are in this formula? The fibrinolytic activity of this formula is what makes it as effective as it is at normalizing inflammation and improving blood circulation. Please note: Because this is an all-natural formulation and not a prescription drug, none of the information presented here has been evaluated by the Food and Drug Administration. Our Proteolytic Enzyme Formula is not intended to diagnose, treat, cure, or prevent any disease. This is an amazing product. I have used it and on the night of dose #2 i felt burning in my knuckles, and the arthitic pain in my knuckles were gone the day after and on. I do not swallow pills anymore due to a very unpleasant experience with a magnesium capsule getting stuck and dissolving in my upper esophageal area. Therefore, I am asking is it safe or still effective to open capsule if it is a capsule or grind up tablet in order to use these enzymes in my regime. I have a question regarding nattokinose, I have had hormonal receptive cancer 11 years ago and was told to not eat soy. Does the fermenting process negate the bad soy effects?